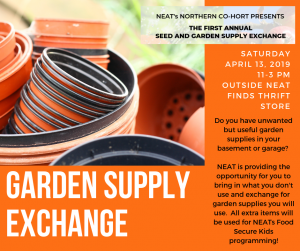 Northern Co-Hort proudly presents the 1st Annual Northern Seed and Garden Supply Exchange being held Saturday, April 13, 2019 from 11-3 pm at the NEAT Offices 10003 95th Ave, Fort St John, above the NEAT Finds Thrift Store. 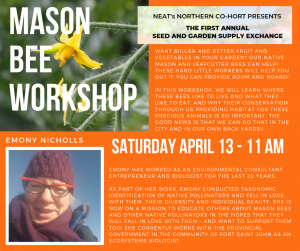 We have a little bit going on for everyone Saturday April 13! 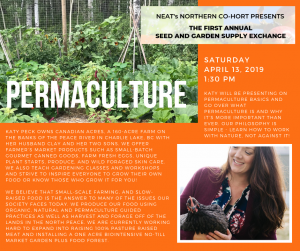 Neat’s new mission and vision is to inspire healthy, vibrant and connected communities to practice sustainable daily actions. 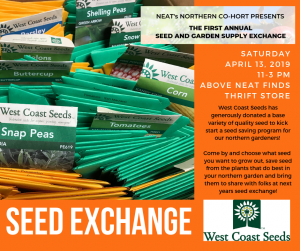 We hope to do just that by inviting you to join us for a full day of seed exchange, garden supply exchange, three great workshops (details below, pre-register to ensure your seat), NEAT composting information station, local vendors with honey, canning, vegetable box program info and live tomato plants! 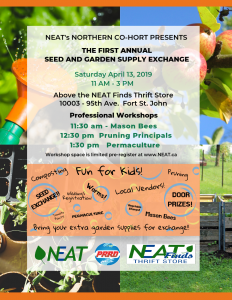 Don’t forget your kids!! 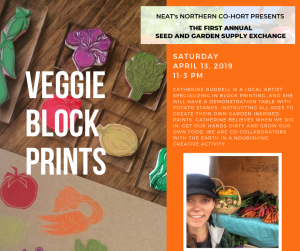 Kids can paint and plant their own flower pot to take home, play with worms and Catherine Ruddell will be helping kids (and adults too) make their own veggie themed block prints! 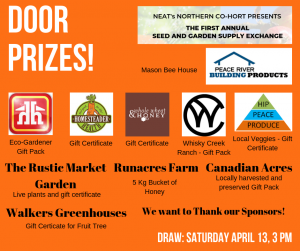 There will be lots of door prizes, seeds and garden supplies to take home! 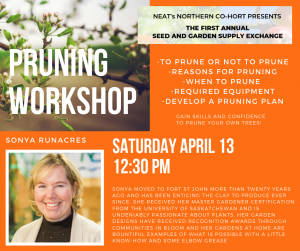 Follow us on Facebook for more details about the workshops, presenters and door prizes!